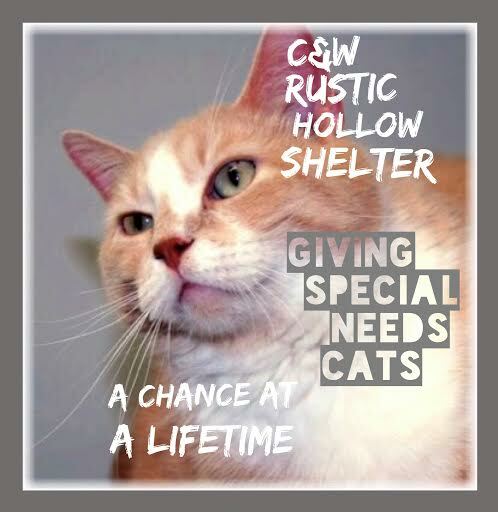 ​ and AmazonSmile donates to C & Ws Rustic Hollow Shelter Inc.
is a 501(c)(3) non profit life care, cage-free sanctuary for special needs felines located on 90 acres near Nashua, Iowa. a ‘chance at a lifetime’. Our team of animal care specialists, volunteers and medical personnel care for up to 340 animals that come to us from rescue organizations in Iowa as well as all over the U.S.
We care for felines with chronic medical, physical, neurological or behavioral issues; felines with Feline Leukemia or FIV+ cats; many very senior 'kit'izens; and felines displaced at the death of their guardian. We offer behavioral counseling to families who want to keep their cat but need to resolve issues they are having with their companion animal. We do our best to help rehome a person's pet in need whenever possible through social networking. C & W hosts spay neuter clinics offering our NE Iowa communities a chance to alter their barn cats, feral cats, stray and companion animals at a lower cost. Conservation is also a part of our mission. 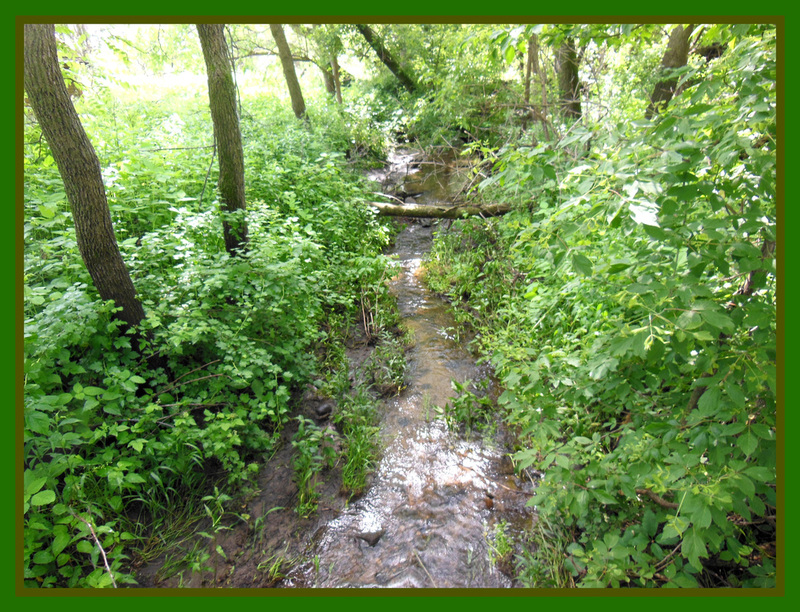 The sanctuary is a release site for rehabilitated wildlife who enjoy the creeks, marshland, and woodlands. We act as a release site for rehabilitated raptors and other animals. It is not uncommon to see the raccoons and opossums enjoying supper on our deck as we feed several of them to keep them from bothering other wildlife. ﻿The sanctuary currently has six main buildings/homes, each with an outdoor screened in ‘catio’ where the felines can go out in three seasons of the year and TV's with Catsitter videos playing for the inside entertainment. See the page﻿ OUR PROPERTY for more photos and information about our facilities. You are welcome to visit. CONTACT US for an appointment. 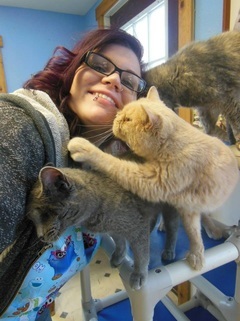 It takes a lot of work to care for the 300+ felines at the Sanctuary. In addition to founders Wanda and Carmen, there is a loyal staff and a dedicated group of volunteers. Click to read about some of our HUMAN helpers. Go here to find out more about becoming a VOLUNTEER. C & W is supported solely by donations, sponsorships of the resident felines, grants & estate giving. We also conduct a variety of fund raisers each year. All sponsorships & donations go directly to the daily care of the felines in residence. 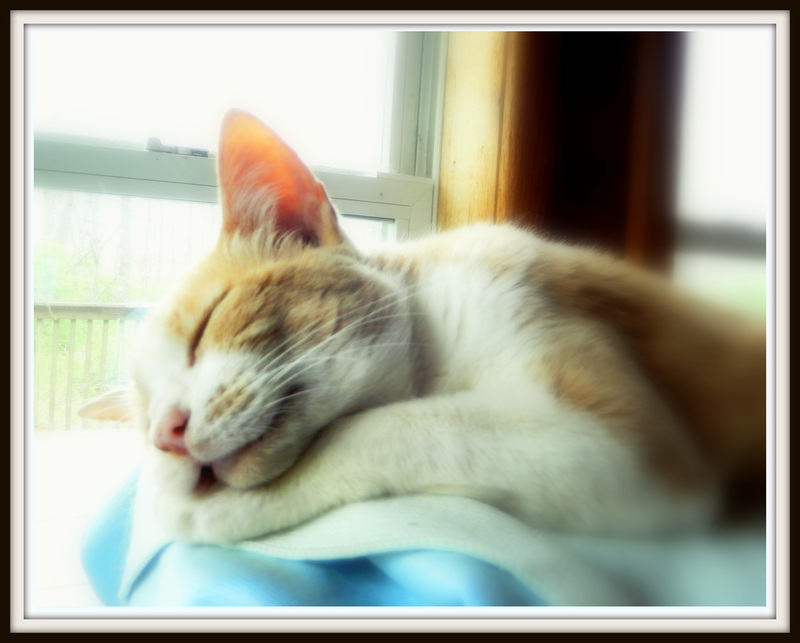 If you would like to sponsor one of the felines it would be purrfectly appreciated. Become a regular supporter of our organization and receive our newsletter & mailings sent out over the year by subscribing to an annual membership. Donations, both monetary and in-kind, are both extremely important so that we may continue our work. See our HOW YOU CAN HELP page for more information on all of the opportunities listed above.